Our product range includes a wide range of wooden table. 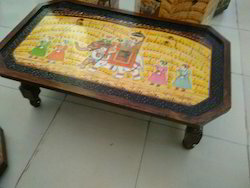 We are an honorable entity engaged in presenting an extensive range Of wooden furniture Table. The offered wooden table is carfting using high grade material in accordance with quality standards under the supervision of skilled craftsmen . Offered table is known in the market due to its excellent finish & designes customer can avail this wooden table from us at affordable rates.